For functional elegance with endless appeal - choose our crystal perfume. 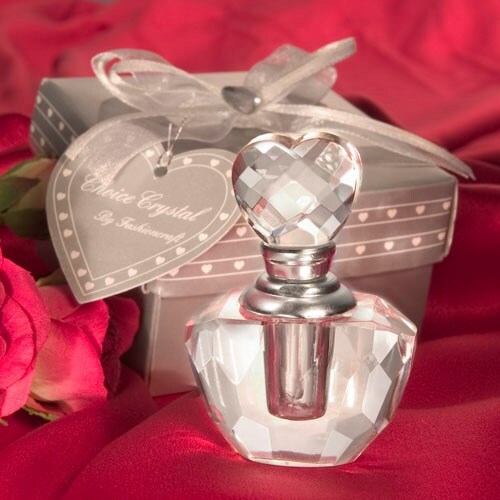 This beautiful and useful wedding favour features a shimmering multifaceted crystal perfume bottle base with a silver accented crystal heart perched on its top. The 2.25 inches x 0.75 inches bottle's top screws off to reveal an attached glass applicator inside. Surrounded by satin inside a silver heart design box (3. 5 inches x 2.375 inches), tied with an organza and satin bow with a crystal heart on top and an attached matching heart shaped tag, these favours make for a stunning presentation.